A pretty white common starfish accents the top corner of this pretty turquoise blue wood frame. This frame reminds you of the ocean with its deep turquoise color! 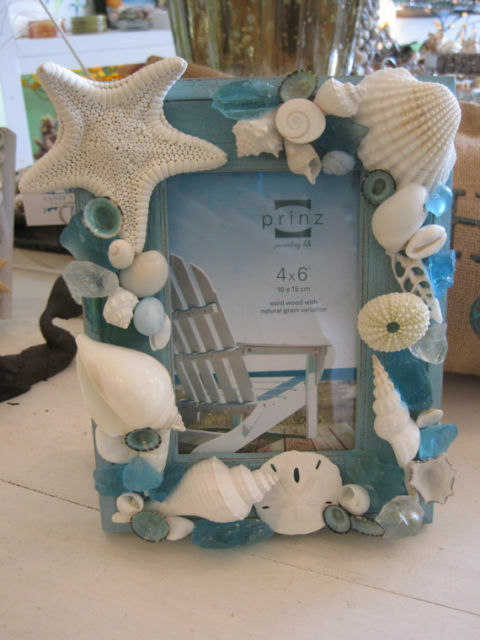 The frame is accented with lots of white shells and pretty turquoise seaglass. There is a white arc shell, a mini sand dollar, blue limpets, white spindle shell, and a tiny green urchin. This would be a great frame to hold a picture from a beach wedding or to frame a favorite day at the beach! The frame measures 9 1/4 x 7 1/4 with the picture opening of 4 x 6.